Dockstavarvet have soon delivered six Fast Pilot Launches to the German Government through Fachstelle Maschinenwesen Nord in Rendsburg. The first boat for Germany was delivered in December 2010 and all six boats are to be handed over before 31.12. 2011. 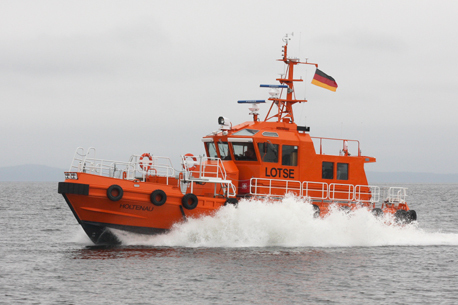 The boats will be operated by Lotsbetreibsverein, Aussenstelle Kiel on behalf of Lotsenbrüderschaft Nord-Ostseekanal II / Kiel / Lübeck / Flensburg replacing 6 boats built in Norway around 1980. The boats will be built in aluminium with classification by Germanischer Lloyd including Iceclass E.
Main dimensions are 16.8 x 5.2 meter and a light ship displacement of 29 tons. Two engines of 500 hp / 367 kW will give a speed at full load of over 20 knots. The arrangement is laid out with a raised wheelhouse with round-the-horizon visibility for two crew members and one pilot. Aft of the wheelhouse at deck level is the saloon with toilet-room, a small pantry, mess and seating for 6 pilots. The entire deckhouse is resiliently mounted to ensure a noise level inside of under 65 db(A) at 90 % MCR. The standard of detailed engineering and equipment will full fill all the demands which can be placed on a State-of-the-Art Pilot Boat with emphasis on safety, fuel economy and long service life with low maintenance costs.